The sandy beaches of New California don’t attract as many people as they used to. Being covered in piles of radioactive waste will do that. 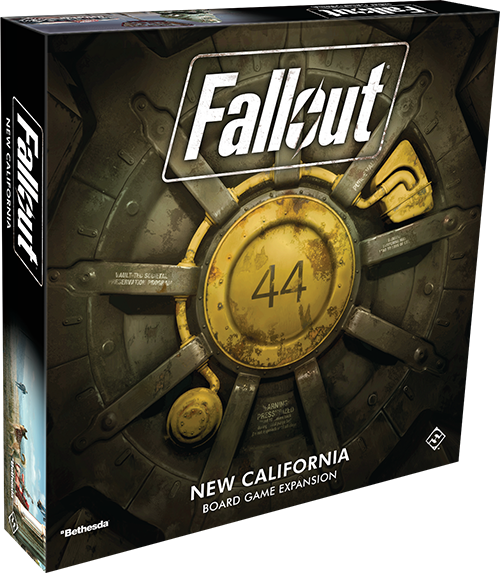 It also means that you’ll be on your own as you wander the wasteland in the New California expansion for Fallout: The Board Game. Out here, everyone looks out for themselves, free to pursue their own agenda and gain influence however they see fit. This continues as you play through expanded versions of the four scenarios from the base game and the new Rise of the Master scenario with the twelve map tiles and other components included in this expansion. Every so often, though, you’ll come across someone—or something—that doesn’t want to eat you and take your stuff. If this should ever happen, you might even team up with these friendly souls and work together for the common good. 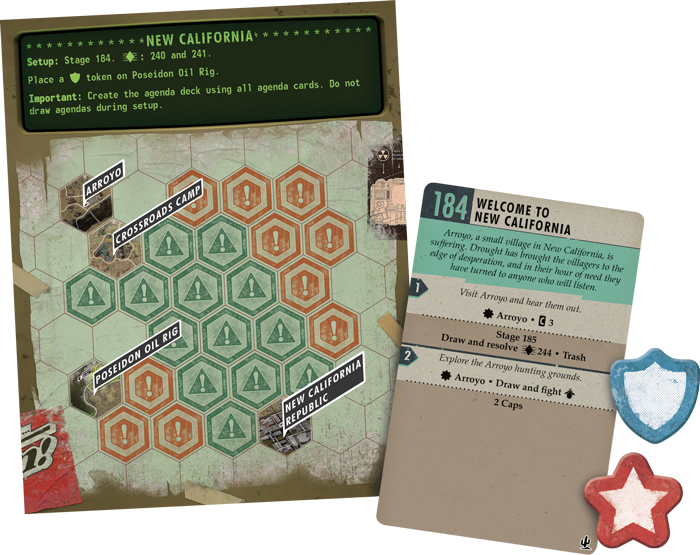 In addition to its other scenarios, New California also gives you the chance to gather a group of survivors and tackle a fully cooperative scenario. Here, what begins as an attempt to aid a small village in the wasteland soon sweeps you into an ever-evolving struggle that will determine the fate of New California. Along the way, you’ll have to coordinate with your fellow survivors to tackle the many challenges that appear down the branching paths you’ll wander. Strap yourself in as we took a look at the challenges you and your chummy compatriots will face as you try to make the wasteland a better place! During any game of Fallout, a common thread is a struggle between freedom and security. Whether you side with the mysterious Institute while exploring the Commonwealth or back the Brotherhood of Steel in their struggle against the enigmatic Unity, each scenario offers different factions for you to ally with as you pursue your goals and look out for number one. In addition to the standard dangers of the wasteland, your efforts in this scenario will be opposed by the mysterious Enclave, who wish to spread their influence into New California from their base on the Poseidon Oil Rig far out at sea. Instead of beginning the game with agenda cards to guide you, you and your fellow survivors must work together to complete the main quest. What ensues could take you to a vault hidden beneath the surface of a lake, deep into the heart of the desert, or even onto the Enclave’s secretive oil rig. As your search continues, a dramatic struggle plays out on the scenario's power track. Completing quests pushes the freedom token along the power track, bringing you one step closer to victory. 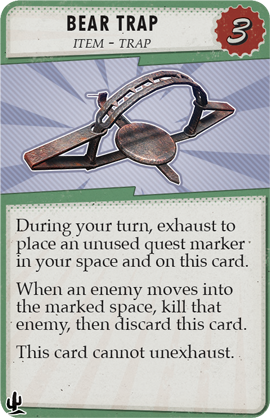 But any number of events—from a survivor being killed to an Enclave enemy activating—can cause the Enclave’s security token to advance on the track as their influence grows. If you're not careful and the Enclave's power token reaches the end of the track, you and your fellow survivors lose the game. Completing the main story quest will bring you one step closer to victory, while gaining a "Security" agenda will push the Enclave's power token back, giving you more time to complete your goals! Keep your chin up, though, things aren’t all bad. You can always help yourself even more by gaining agendas. Instead of tracking your influence in the wasteland, in this scenario agendas are another way for you to control the power tokens. Gaining an agenda with the "Security" title will move the security token one space backward on the power track while an agenda with the "Freedom" title advances the freedom token toward the end of the track. Better yet, all other agendas let you choose which effect to resolve. So go grab those agendas, hotshot, and save Arroyo! 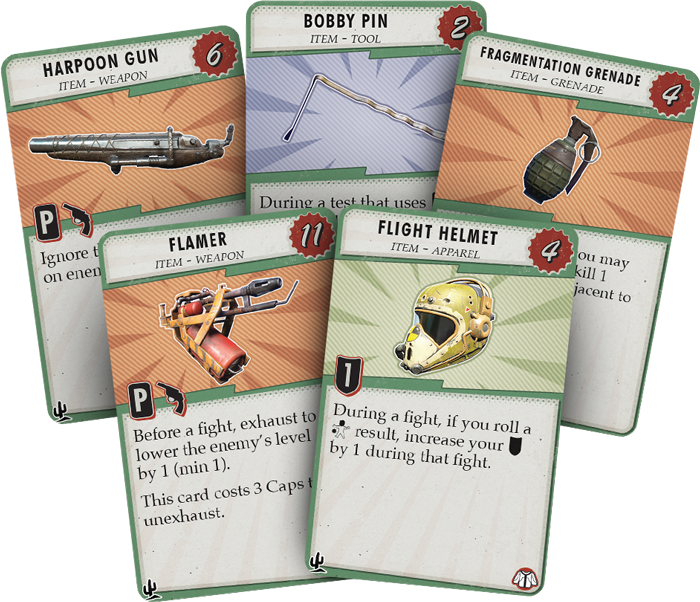 Going up against the Enclave is no easy task, but luckily New California provides you with a host of 21 new asset cards that should make helping the citizens of Arroyo a bit easier. From weapons to companions to apparel, these cards give you the kick you need to go from zero to hero! Weapons may be hard to come by in the wasteland, but—for the right price—some of the most powerful weapons you’ve ever seen can be yours. Need to wipe out a large group of Enclave Soldiers? Look no further than your handy Missile Launcher! 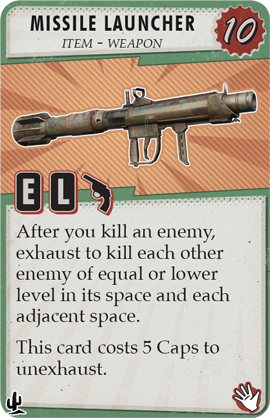 You can exhaust this weapon after you kill an enemy to kill each other enemy of equal or lower level in its space and each adjacent space. How’s that for making a splash? If you prefer keeping your enemies a bit closer, you can always turn to a trusty Rockville Slugger. 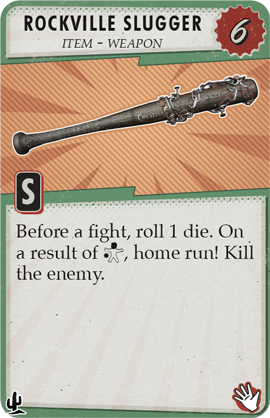 You might not be able to blow anything up with this simple baseball bat, but you’ll still have the chance to knock your foes out of the park with this weapon, killing them before the fight even begins. Not every encounter in the wasteland has to devolve into fisticuffs, of course. There are still a few civilized survivors out here and they prefer to deal with their problems with a Bear Trap. You can use this card to place a Trap in your space. When an enemy moves into the space… well, let’s just say they won’t be leaving it any time soon. Finally, you’ll need to do a bit of sleuthing while helping the residents of Arroyo, so it’s only fitting that you look the part. 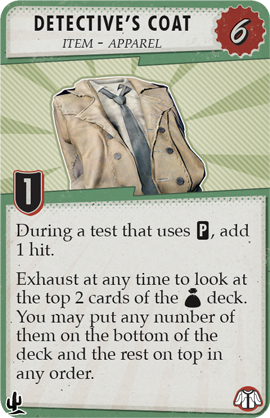 As soon as you don your Detective's Coat, you’ll get an automatic hit for every test that uses Perception. 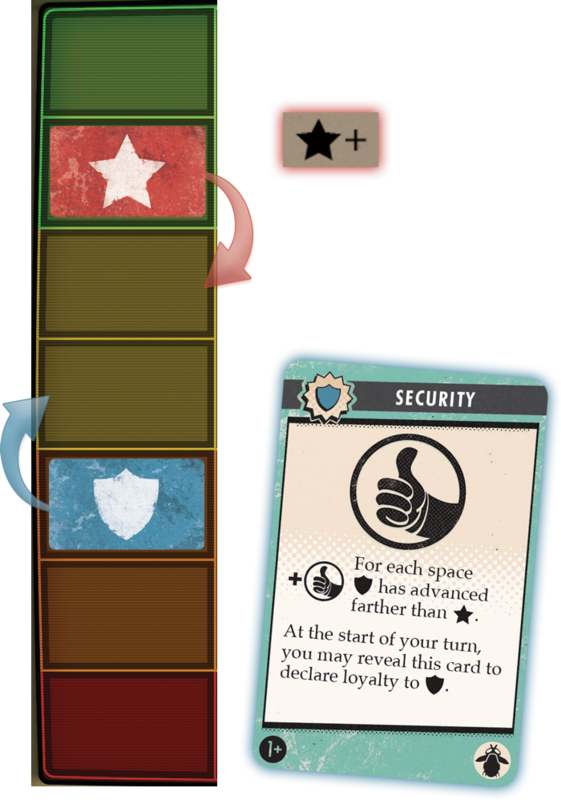 Additionally, you can exhaust this card at any time to look at the top two cards of the Loot deck, arranging them as you see fit to be sure you find what you're looking for! Arroyo needs your help. 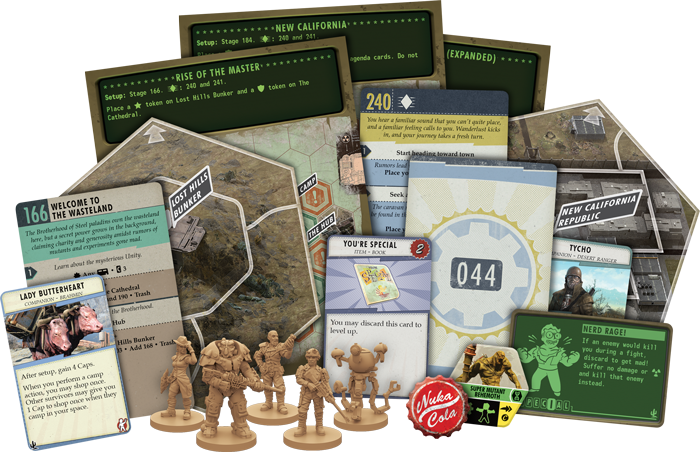 Band together to tackle this challenge and you all might just become legends of the wasteland in this fully cooperative scenario for Fallout: The Board Game!